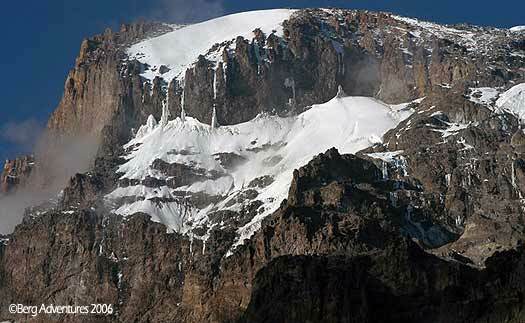 It’s February 13 and I’m calling you from the Lava Tower Camp that’s at 15,000 feet or about 4,500 meters on Kilimanjaro. I’m looking down at the Berg Adventures camp, its amazing landscape here; it’s like a moonscape some people say. There are a lot of large lava rocks strewed about and it’s very dry and it has its own kind of strange beauty. 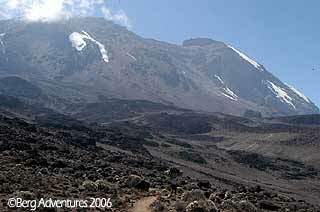 Looming above us through the clouds right now and we’ve seen it since we’ve arrived and I don’t know if we’ll see it in the morning is the giant breach wall of Kilimanjaro with those huge glaciers hanging off. This is really an inspiring and exciting place. It’s great and amazing that this crew of 43 BCACL climbers from British Columbia is here after the traverse across Kilimanjaro so far. Every day is long, believe me. We arrive into camp hours apart, we always travel at our own pace and of course with 20 Berg Adventures guides and a lot of other Tanzanian staff that are helping us it’s easy to do that. We have radios, we check during the day to find out how everyone is doing and as you come into camp it’s amazing because you are always greeted by a large number of people, more than 100 Berg Adventures staff and porters go running out singing these joyous and inspiring and heart felt African songs. They swarm around the people coming in and congratulate them. There are tears coming down their faces every time this happens when everybody comes in. It’s an inspiring and heart warming scene. We are tired but we are taking very good care of ourselves. Every morning there is a little table set up at the end of our long dining hall and you have to go see Leila and she takes a reading of your percent oxygen saturation of your blood. She also asks you a lot of questions about how you’re feeling and how you slept. And of course Dr. Martin is here and he’s seeing people about various ailments and mainly giving people his wonderful advice about how to climb Kilimanjaro and share the love he has developed for this mountain on Berg Adventures trips in the past. People can tell that Dr. Martin’s Pole Pole will get them to the top and the gleam in his eyes when he talks about this challenge is inspiring to us as well. 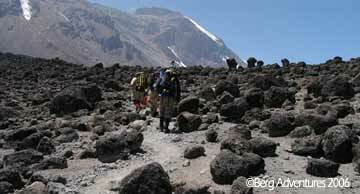 Tomorrow we are going to move over to base camp and we’ll begin to prepare to move higher on the mountain. All 43 members of the team are here which is not a small feat. We see other teams turn back every day, this mountain is a real challenge and many people turn back at lower elevations than us. But we’re still together and moving higher.